← Pinot Noir, Haywire, Secrest Mountain Vineyard, Okanagan Valley VQA, BC, 2015, 13.5% abv. Here’s another Spanish white for your sipping pleasure. On the eyes, medium lemon with aromas of nose-tingling rocks and salinity with lemon zest. On the palate, dry with medium plus juicy acidity and flavours of citrus – lemon, pomelo, pink grapefruit – salty, wet rocks and almond. WSET Good plus – lovely little porch sipper, a little hollow in the middle, and not terribly complex, but tasty and excellent value for your dollar. Goes great with jerk chicken and salad. 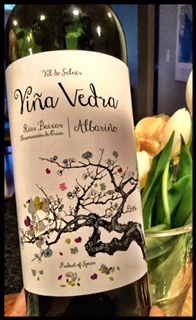 This entry was posted in OTHER and tagged 2013, Albarino, Rias Baixas DO, spain, Val do Salnes, Vina Vedra, white wine, wine. Bookmark the permalink.